While there’s no real reason to want to run an iPad app on your iPhone or iPod touch, few will argue that this is just plain old cool. 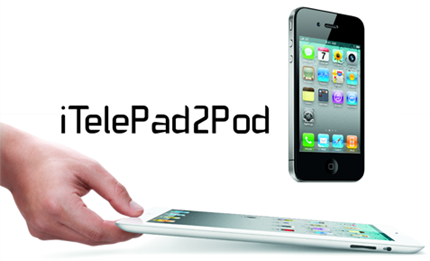 One clever little coder has written an app called iTelePad2Pod that will make the magic happen. Obviously a jailbroken device is a necessity here, but you already did that didn’t you? One added bonus of this hack is the ability to transfer your purchased iPad apps to your iPhone via SSH (OpenSSH must also be installed on your iDevice) – no wires and syncing for you! Unfortunately this doesn’t work 100%, with not all apps behaving correctly but who cares? It’s cool! You will, of course, need to have a jailbroken iPhone to install it. Follow our step by step guide posted here to jailbreak your iPhone, iPad or iPod touch with Redsn0w on iOS 4.2.1 (or untethered with GreenPois0n RC5), or with Limera1n on iOS 4.1, or on iOS 4.3.1 with Redsn0w, PwnageTool 4.3 (untethered | tethered), or with Sn0wbreeze on Windows, or on iOS 4.3.2 with Redsn0w, PwnageTool 4.3 (tethered), or with Sn0wbreeze on Windows if you haven’t already. 3. Move the iTelePad2Pod folder to the /Applications Folder on your Mac. 5. Follow instructions in the app.